Discussion in 'Vintage Finds and Deals' started by regius, Mar 19, 2019. Found this English seller of some interesting & affordable German, Italian, French & Swedish goatskin coats. But the seller is also quite verbal & funny when it comes to negative feedbacks. Mn. I'd be wary of dealing with somebody like that, tbh. Mind you some ebay buyers are a nightmare. Years ago, friends sold a dolls' house jacuzzi. You wouldn't believe how many people - no matter how clearly they labelled it - emailed them asking if the did installation, could they deliver, technical queries about plumbing it in..... Thy even had its actual measurements (smaller than foot tub....). Yes, not sure I would want to do business with the guy but I do admire his willingness to say the unpolitic things that I have often thought and not said out loud. And he is totally unapologetic about it all. Obviously must be enough folks who want to deal with him to keep it going! I’m sure I’ve bought from him with no trouble but so long ago I can’t find his feedback to me I follow him on eBay as he has a high turnover of vintage jackets which always seem to be well described and he offers 14 day returns. I think it’s inevitable that some people will be disappointed in which case they should return the item and leave appropriate feedback- nuff said. ruvort and Edward like this. That's the type of seller to avoided at all costs, afaic. Everything could go fine, but it's not worth the risk. He talks about a buyer being a keyboard warrior, but he writes in a way that no in-person entrepreneur would speak, face to face. That's a keyboard warrior. seres, Edward and Metatron like this. Yes, this thread does not have an edit option. I wonder why. Ok, just my 2 cents here..... 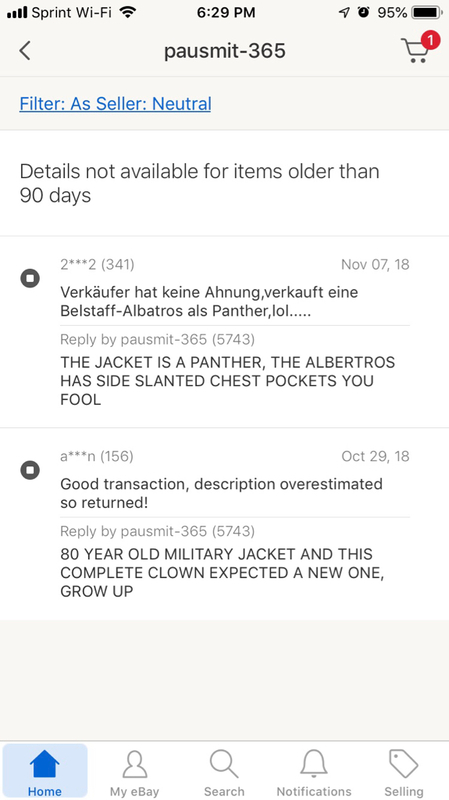 I have bought several jackets from this Seller. Admittedly, I have not needed to ask many questions if any regarding condition of the jackets at all. He DOES routinely carry unique and very reasonably priced jackets from Europe mostly. Frankly, I read the complaints and his responses and I don't see any issue other than the strange claims that "revenge" is coming Lol. Obviously, my own experiences have been positive with this Seller so this may shade my opinion here. As I see it, he is a total no nonsense, AS-IS Seller. He doesn't go over the top on his descriptions but I have not found them to be misleading per se. 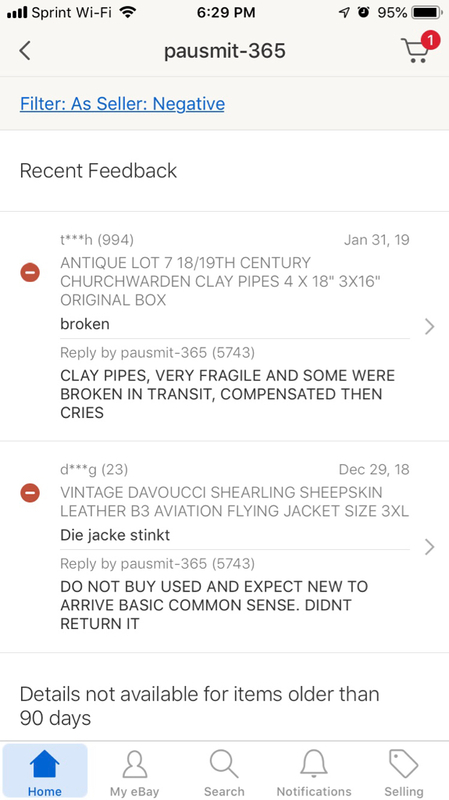 One jacket I purchased is 50+ years old and absolutely perfect yet its description was very sparse and didn't tout the condition as being particularly good or bad. His inventory is pretty large and constantly turning over. His photos could be better in some cases. But I DO agree somewhat with the tone he takes--not everyone is understanding of Vintage Clothing and the imperfections and wear that come with buying decades old items that may have been poorly stored. Clearly, many of his offerings are old, used, and likely scavenged from second hand stores in Europe. He has language on his listings basically offering a fairly generous return policy and he openly states that he is very willing to make a situation right should a buyer be dissatisfied. I think what sets this guy off is when people do not engage him on returns or on giving him the chance to make the situation right and instead resort to leaving Negative Feedback that impacts his reputation as a Seller. He is pretty clear that he will work with Buyers to rectify issues and that there is no need to leave negative feedback because he will do what is needed to fix whatever issues a Buyer has. Its the same as on Yelp where you see complaints that have never been addressed with the Business involved and the Business Owner comes out and says, "Why didn't you tell us about your problem?? We would have done X Y Z...."
Honestly, complaining that a Vintage item smells or has wear marks on it etc. is nit picking IMO. You're buying a very old garment that someone else has owned and worn. Shocker--its not gonna smell like a Nordstrom giftwrapped purchase. If you are dissatisfied Buyer and would rather take to the Internet to post your grievance without ever addressing it with the Seller, that is chickensh*t. One should always act to exhaust all remedial possibilities before resorting to a negative review. 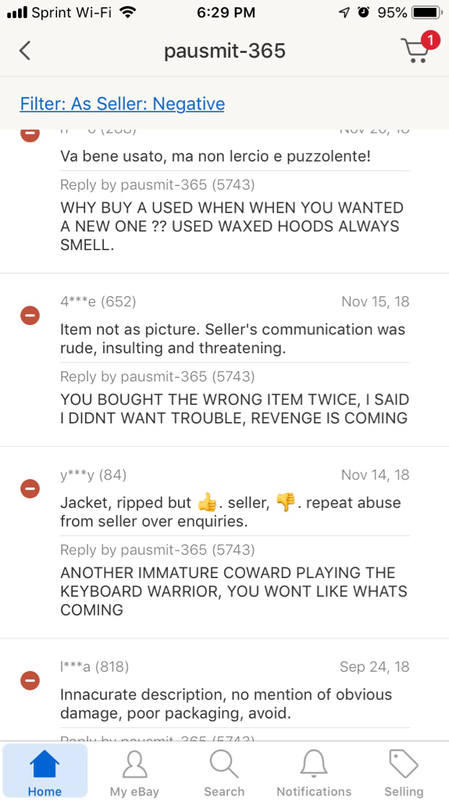 Now if you've gone back and forth with the Seller and he keeps threatening you with impending "REVENGE" and refuses to adequately address a reasonable complaint, then by all means, go ahead and scorch the earth with negative feedback and comments. Having dealt with him I would say not to judge this seller strictly on the amusing comments posted. I don't even think the OP is putting the Seller down as much as he is drawing attention to the fact that this Seller doesn't sugarcoat anything or take the PC high road when his sales are called into question by buyers who don't seek to rectify their complaints with him prior to going public with them. As I said, just my 2 cents.